At my clinical practice, we frequently use scribes to document in the EHR while we focus on patients. While most of our scribes are cross-trained emergency medical technicians or medical assistants, some are college or graduate students who are looking for experience in the field while they apply to medical school. My favorite scribe was recently admitted to medical school. Since he doesn’t have any family in town, he invited me to sit in for his family at his school’s white coat ceremony. We didn’t have that ceremony when I went to medical school, but quite a few schools have them now. 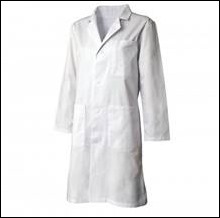 Often in their first year of training, students are presented with the traditional white coat and may take an oath. Schools have gotten away from the traditional Hippocratic Oath (mine used the Declaration of Geneva), but his school encourages each class to write their own oath. It was quite moving to see the students promise to keep the patient at the center of care and to deliver care equitably regardless of gender, race, religion, or sexual orientation. I didn’t hear anything about sacrificing patient care time to address burdensome regulations and reporting requirements, but they’ll be learning about those aspects of medicine soon enough. 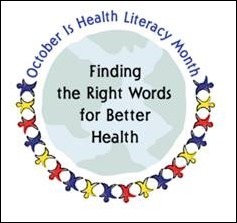 October is Health Literacy Month, aimed at helping promote the importance of understandable health information. Greater health literacy can lead to improved health status and may be more of a contributor than other factors such as race, ethnicity, or socioeconomic status. Although many EHR vendors try to increase health literacy by making sure their patient education materials are at an accessible reading level, there are other factors at play. The National Patient Safety Foundation is promoting its “Ask Me 3” program that encourages patients to ask three questions to better understand their health: 1) What is my main problem? ; 2) What do I need to do? ; and 3) Why is it important for me to do this? I’d love to see more EHR-generated patient plan documents that address these questions in a readable format rather than just spitting out codes and canned phrases that may not make sense for patients. The rising cost of health care and subsequent attempts at reform are impacting care delivery across the country. My local school board just voted to investigate the possibility of onsite health clinics for employees and their families. They’re not ready to address health clinics for students, but the employee clinics are seen as a possible way to not only get employees back to work more quickly, but to control costs. We perform similar corporate health services at my clinical practice and can generally get patients treated and back to work with their medications in under 45 minutes. I’ll be interested to see how it turns out and whether the promise of efficiency and cost-control outweighs any privacy concerns. 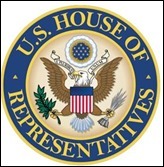 Nearly 180 members of the House of Representatives sent a letter to CMS claiming that recent payment reforms announced by the Center for Medicare and Medicaid Innovation (CMMI) exceed the authority of CMS and are therefore illegal. The legislators contend that voluntary programs are acceptable, but mandatory participation in programs such as bundled payment programs can “commandeer clinical decision making and dramatically alter the delivery of care.” They go on to “insist CMMI stop experimenting with Americans’ health.” I’ve spoken with many of my peers who feel that MU and other programs are out of control experiments with no requirement for institutional review board approval. It remains to be seen if using financial incentives against providers will really drive the needle on patient outcomes. I wrote earlier this week about some downtime/disaster recovery adventures I had with one of my clients. A reader commented on my mention that “since crossing to the IT dark side, I’ve had more late night phone calls for database disasters than I’ve had for patient care issues, but the steps are surprisingly similar,” wanting to know more. Getting to the root cause of an information technology misadventure can be a lot like trying to diagnose a patient who presents with vague symptoms or a complex condition. Like a person with a stroke, it’s important to know when was the last time that the system was normal, what the presenting symptoms were, and how quickly it progressed. Similar to a person having a heart attack, you have to act quickly within a limited time frame so that more extensive damage doesn’t happen. You have to assimilate data from a variety of sources and try to put it all together in the hopes of figuring out what happened, what is currently going on, and how you can identify the best intervention. Sometimes you try maneuvers that are both diagnostic and therapeutic. They may or may not work depending on the status of the patient/system. It’s important to have a skilled team that can work well together and has common goals. When we teach CPR and advanced cardiac life support, we talk about closed-loop communication and following algorithms for prescribed interventions. Both of those apply to downtime and disaster recovery situations. Not unlike medicine, sometimes you lose a patient. But when you make a save, it’s extremely gratifying. Mr. H recently polled the reader base on desirable qualities for sales team members. He mentioned that military service ranks #1 on his list. I work with numerous veterans and have to say they’re high on my list of desirable employees and co-workers as well. I recently finished reading a book called CONUS Battle Drills by Louis J. Fernandez. 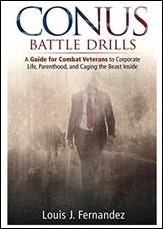 Subtitled “A guide for combat veterans to corporate life, parenthood, and caging the beast inside” it also offers good perspective for those of us who hire or work with people who have been through situations we can barely imagine. I’m grateful for all the men and women who have served and who have continued to serve and look forward to having them on my team. 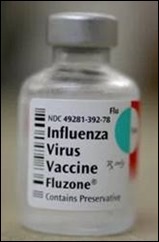 I’m going to put my physician hat on for a minute and remind everyone to get a flu vaccine. There was some buzz earlier this year about whether receiving the vaccine too early can reduce its effectiveness, which may have led some people to wait. Although some think the flu is no big deal, it kills nearly 24,000 people in the US every year, including 100 children. It can also cause life-threatening complications. The vaccine used to be recommended only for high risk patients, but now vaccination is universally recommended for everyone over six months of age. Let’s roll up our sleeves and get the herd immunity going. Does your employer mandate flu vaccinations? Email me.